(CNN) -- Chelsea posted losses of £65.7 million ($93.91m) as they were left to count the cost of managerial departures. Guus Hiddink is the third coach to take charge at Chelsea since Jose Mourinho departed in 2007. The results for the financial year ending on June 30, 2008 revealed that £23.1 million ($33.02m) had been paid in compensation to former Blues managers Jose Mourinho and Avram Grant and five coaching staff. They do not include the payout that Luiz Felipe Scolari is set to receive, reported to be in the region £8 million ($11.44m), following his sacking this week. 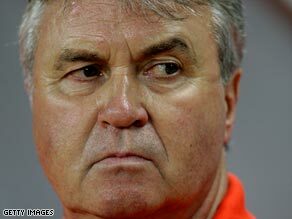 The results come as Guus Hiddink took charge at Stamford Bridge until the end of the season, combining his duties as Russia national coach. The Dutchman gave an upbeat assessment of Chelsea's prospects for the rest of the season, despite a string of indifferent results which led to Scolari's replacement. "There is a 10-point difference but if you look in the past of this league and other leagues as well, some things can happen during the final stages of the championship." His assistant Ray Wilkins will stay in charge for the FA Cup fifth round tie against Watford on Saturday before Hiddink takes the reigns ahead of crucial matches against Aston Villa in the Premier League and Juventus in the last 16 of the Champions League. Hiddink only agreed to take on the job because of his close friendship with Chelsea owner Roman Abramovich, whose billions have helped the west London become one of the leading clubs in Europe. Friday's financial results represent a further improvement after the record losses of £140.5 million in 2004/05, with Abramovich reducing the debt the club owe him personally by half. He has turned £369.9 million of his loans into shares in the club, but it still means that Chelsea owe him £339.8m as an interest-free loan. Chelsea also pointed the "record group turnover and reduced losses for a third successive season" in an official statement on their Web site www.chelseafc.com. Chief executive Peter Kenyon said they were committed to breaking even by 2010 and gave a clear warning that the club would not be repeating the big-spending of recent seasons. "In line with our long-stated business aims, any squad structuring in the summer will be funded prominently by sales as we have consistently reduced our net transfer spend over the last five years and will attempt to continue this trend," he told the Press Association. The new financial strictures will represent a challenge to Scolari's long-term successor, with Hiddink continuing to insist he will honor his contract with Russia as he attempts to lead them to the 2010 World Cup finals. "I have seen it here now and I felt the atmosphere already in a few hours, but what happens after May is clear because it is rather difficult to do the two jobs, and I have my obligations in Russia," Hiddink said.